The following tutorials cover the creation of the main types of VPN tunnels. The examples build on each other, that is, the configuration settings in an example builds on that of the previous. We will use Preshared Key authentication initially. This is the easiest to setup. There is no need for a CA or any certificates. Set to the opposite end’s remote network value. The local IP address client connect to. All other settings can be left at their defaults. In order for traffic to flow through the tunnel, you must create a firewall rule that bridges the local network and the IPSec interface. If you want traffic to flow in both directions, you should create two rules. You do this on the Network > Firewall > Firewall rules page — see Using the Smoothwall Firewall and How do I create a zone bridging rule in the new Firewall?. Restart the VPN system on both ends. Both ends are set as initiators, therefore the tunnels should come up immediately. To actually test that the VPN is routing, ping a host on the remote network from a machine on the local one. You should also be able to connect to servers and desktops on the remote network using your standard tools. Note: When configuring multiple PSK-based tunnels, use the User specified IP address as the remote system ID type and the remote system external IP in the Remote system ID Value. In this example, the same network as used in Example 1 is used, see Example 1: Preshared Key Authentication. This time we will improve the setup by using x509 authentication instead of PSK. 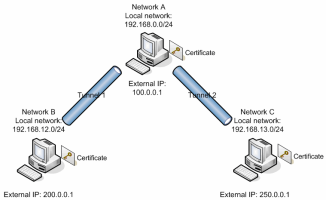 Network A is configured to be the Certificate Authority in the system. From now on, we will enter My Company Ltd in all Organization fields on the certificates we create. Next you should export this certificate in PEM format. We will call this file ca.pem, and save it on the local workstation’s hard disk. You will need this file later. Create both certificates, and then export the Network B Cert certificate in PKCS#12 format. You will need to enter the passphrase to encrypt this certificate with; enter it in both boxes. We will call this file tunnelb.p12. Now onto the tunnels page. Choose the Network A Local Cert certificate to be the Default local certificate, and press Save. We will Restart the VPN shortly to make this change active. Set to the opposite end's remote network value. The first step is to import the certificates. 1. On the Certificate authorities page, import the ca.pem file. 2. On to the certificates page, import the tunnelb.p12 file you created earlier. Remember to input the passphrase used to create the export file in both boxes. As before, restart both ends of the tunnel. If the tunnel fails to come up, the most likely cause is a mismatch of IDs. Check the IDs in the certificates by clicking on them in the certificate page. The ID is the same as the Certificate ID. Examine the log for telltale messages. We will now add an additional system, Network C to the VPN network. We want Network C to be able to access both the Network A subnet and Network B. In Extended Site to Site Routing, we explained how to create centralized VPN hubs using extended subnetting. We will use this technique to allow Network B to route to Network C, and vice versa. Notice how this subnet mask now covers all subnets in the VPN. Test in the same way as before. After bringing up both tunnels, you should test by pinging a machine on the Network A end from both of the Network B and Network C networks. Then you should test that you can route across Network A by pinging a host on the Network C network from the Network B network. Now we will add a road warrior, running a Shrew Soft VPN client. This road warrior will connect to the Network A gateway. 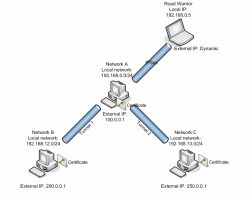 In addition to being able to access the Network A local network (192.168.0.0/24), the road warrior is able to access Network B and Network C as well. Note: No ID is required on this certificate. Export the certificate in PKCS#12 format. We will call this file computercert.p12.You will also need the CA file, ca.pem. To bring up the connection, the simplest way is to ping a host on the network behind the gateway. After a few retries, you should see the task bar icon change to show a yellow key. This indicates that the tunnel is up. Your client computer will then appear to be connected to the local network behind the VPN gateway. This works both ways; a machine on the local network can connect to the road warrior. You should be able to browse web servers, and so on. Also, because the tunnel covers all three local networks, you should be able to connect to all three. This example consists of an additional road warrior client, this time running Microsoft Windows XP and using Microsoft’s L2TP road warrior client. Export the certificate in PKCS#12 format. We will call this file computercert.p12. You will also need the CA file, ca.pem. 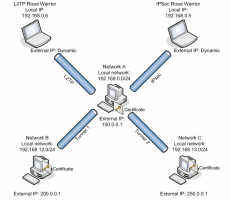 This tutorial only outlines the process of configuring an L2TP client. For detailed instructions, seeUsing the Smoothwall L2TP Client . Begin by using the L2TPWizard to import the two certificates. After bringing up the New Connection wizard, the only details that must be configured is the VPN gateway external address, 100.0.0.1 in this example. Finally, press the Connect button to initiate a connection the Smoothwall A VPN gateway. In order for traffic to flow through the tunnel, you must create a firewall rule that bridges the local network and the L2TP interface. If you want traffic to flow in both directions, you should create two rules.